He was so right, don’t you agree? So today, on my birthday, I took him at his word and did exactly what I wanted to do. I think my Mum and Dad must have brought us up to believe in the importance of birthdays. I was always told that I could tell when my special day was approaching because all the roses would be budding. My Little Sister, three and a half years my junior, was told that it was the swishing of Autumn leaves on the pavements which heralded her birthday. I need to check with my two older brothers how they knew when their birthdays were approaching; I can’t believe I haven’t asked them before. I was born, according to the midwife who attended my home birth, at two minutes to midnight on June 6th. My dear Mum has always been adamant that the clock was slow and that I had actually been born on June 7th. She justified this belief with the claim that the midwife clearly wanted to cut down on her visits by a day which may well say something about her relationship with said midwife. Although, because I was quite, well, young at the time, I am not qualified to express an opinion. Be that as it may, my birth certificate says June 6th so that it the day I celebrate my birthday. At a push, I’d be perfectly prepared to extend the celebrations into tomorrow - just to be on the safe side, you understand. Plus why have one birthday, I always say, when you could have two? Or perhaps we should make that three birthdays because I did, of course, have a splendid celebration last Sunday which you may (or may not) have read about on my previous blog. 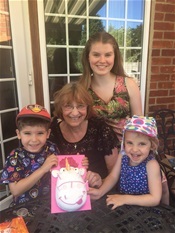 I’d opened cards and presents, blown out the candles on my unicorn cake (with help from the Trio of Rampaging Rascals) and thoroughly enjoyed some family time. Today was quieter - until Kay who helps me keep my house in order turned up singing Happy Birthday at the top of her voice and the postman arrived, bearing gifts. What a lucky Birthday Girl I am! In all, I was treated to several renditions of the Happy Birthday Song. The Trio sang it, not once but twice, via FaceTime, with lots of love and kisses. The (Not So Very Little) Welsh Boys and their parents put together a short video in which each lad had a line to sing, ending up with the whole family singing the final line round the table. It was an Oscar-winning performance, in my book at least. My Little Sister and her fella treated me to their own particular take on the song, including all the right notes but not necessarily in the right order. One of my favourite birthday messages came from granddaughter Hazel Bagel, who is on holiday in Italy with two of their her friends. She sent me a video of her throwing a coin into Rome’s famous Trevi Fountain and making “massive birthday wishes” for me. Thank you to everyone who sent me such special, thoughtful birthday wishes - I feel truly blessed. What’s the good of a birthday, if you can’t do what you like...?